You don't have to have a pay pal account to make a purchase and you can use credit cards through this link. Just follow the directions. thanks! 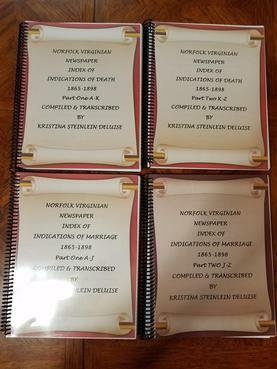 these books are shipped MEDIA MAIL......and all prices include shipping..
the appraisements, sales and audits however ARE ABSTRACTED. write the book for several months, and it was during this time that not only had the hand writing changed (aka the reason I think there was a substitute) but the person could not spell. Therefore there are 3 wills where the wills have been transcribed by how they "sounded" when read outloud rather than how they actually read. and the translation done by Google, and slightly fixed by me so that the sentences made sense. Approximately 180 pages, plus index, introduction etc. 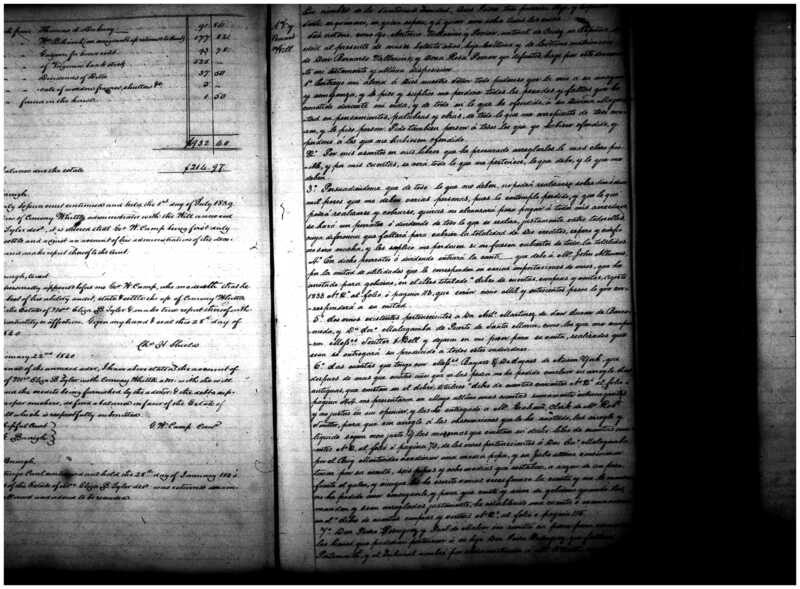 Inventories, Appraisements and Accounts No 1, 1850-1856 and Inventories, Appraisements and Accounts No. 2 1856-1875. I started this book where George Tucker’s 1797-1850 book left off and actually there is a small amount of overlapping with the two books. There are approximate 1200 marriage records in this book. 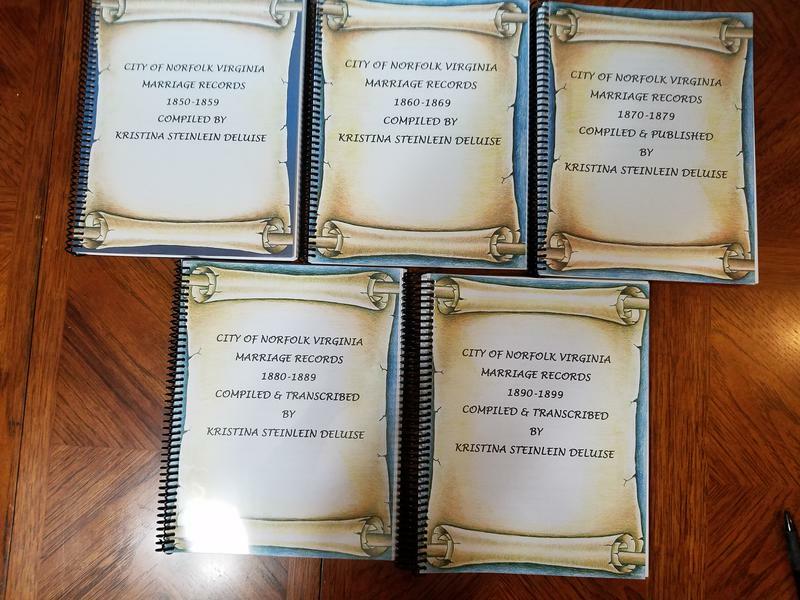 I used marriage bonds, minister’s returns, and the marriage register along with the first form marriage licenses to complete this book. This book is different from all the rest because in this book I show the evolution of the marriage record. 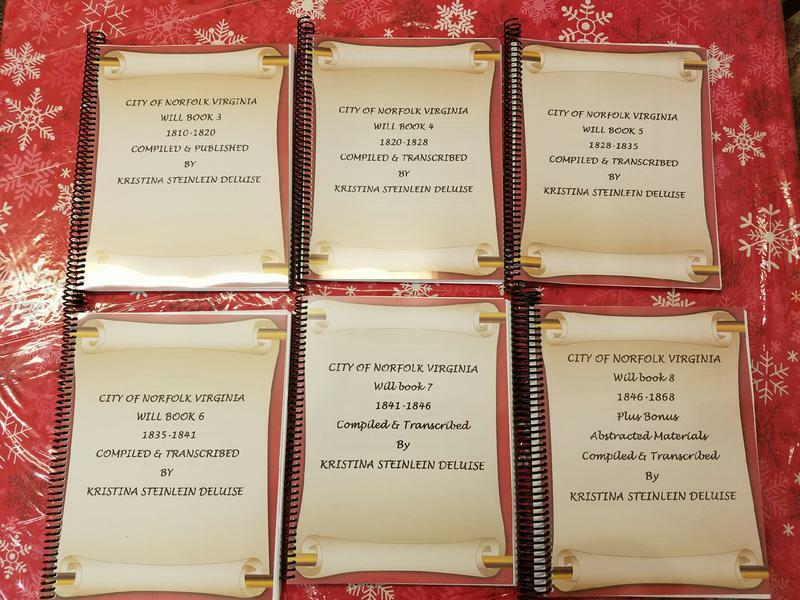 I show you what a marriage bond looked like, what a minister’s return looked like and the first two form marriage licenses that came into being in the City of Norfolk. This book is the only book of the 5 that is in date order and includes an ABC index, where you find your ancestors name and then look him or her up by the date. This book includes approximately 1600 marriage records recorded from marriage bonds, marriage register and marriage licenses. This book includes a sample of what the marriage license looked like during this decade. This book is alphabetized by the groom’s surname. Also as a bonus feature, after 1865 if your ancestor’s marriage appeared in the Norfolk Virginian Newspaper, it is indicated on the spreadsheet. I use many made up abbreviations in this book, and I include a at a glance key to help you with them. 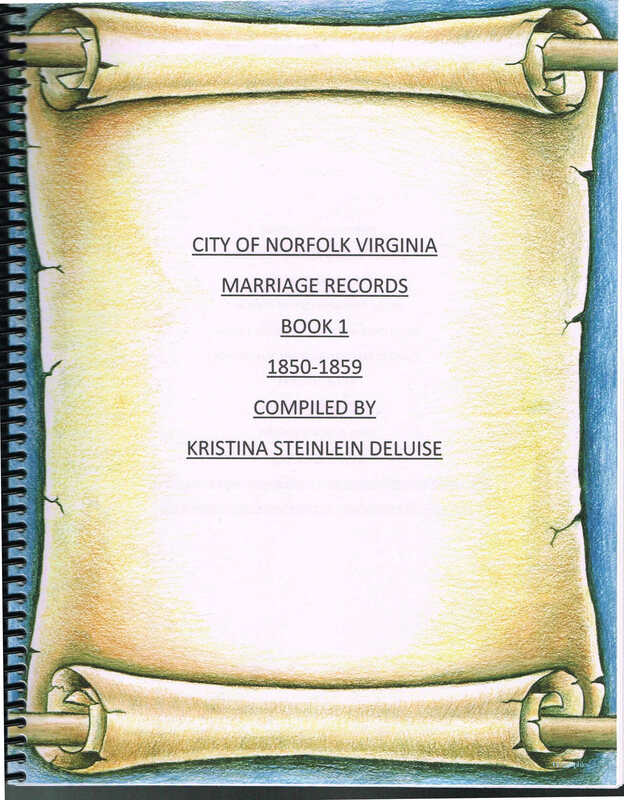 This book includes approximately 2000 marriage records using the marriage register, marriage license and the Norfolk Virginian Newspaper. This book includes a sample of what the marriage license looked like in the 1870’s. It was also in the 1870’s that the marriage license was expanded to included color. 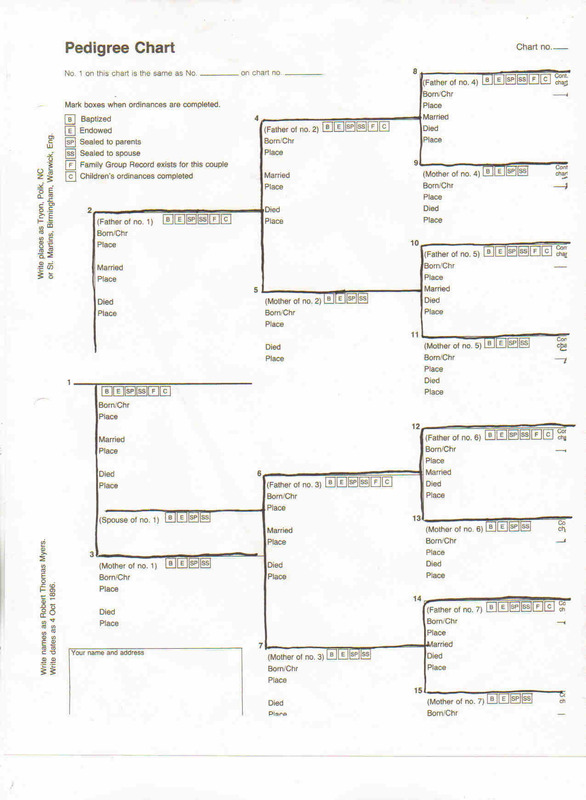 Included is name of Groom and Bride and ages and marital status along with place of birth and parents names if known. Also if your ancestor’s marriage notice appeared in the Norfolk Virginian Newspaper, it is also noted. Again, I use a lot of made up abbreviations, and an at glance key is provided to help you. This register is in alphabetical order by the grooms surname. This book includes approximately 3000 marriage records from the marriage register and the marriage license. This book also includes a sample of the 1880’s marriage license. This book also includes a notation if your ancestor’s marriage article appeared in the Norfolk Virginian Newspaper. The deluxe edition of this book is available for $55.00 and it includes a few maps and narratives of the annexations and the full marriage evolution to this point. This book includes approximately 4500 marriage records from the marriage register and the marriage licenses. This book is in alphabetical order by the groom’s surname. A sample of the 1890’S marriage licenses is included, it’s the only one out of the 5 decades of marriage licenses not written by the city clerk. This book also includes a indication if your ancestor’s marriage notice appeared in the Norfolk Virginian newspaper. The deluxe version of this book is available for $55.00 and includes a few maps, a few narratives and the evolution of the marriage record to this point. Listed by Surname in a loosely alphabetical order is a list of people whose marriage was indicated in the newspaper either by actual paid marriage notice, a newspaper article or a line of gossip. Included is date of the newspaper, names of groom and bride and location if provided along with page number and column number. This book focused mainly on the local area, Virginian, North Carolina, Maryland, and Delaware. I did not include marriages of Kings & Queens or Governors or Presidents or famous people etc. Approximately 224 pages plus introduction. 10. Listed by Surname in a loosely alphabetical order is a list of people whose marriage was indicated in the newspaper either by actual paid marriage notice, a newspaper article or a line of gossip. Included is date of the newspaper, names of groom and bride and location if provided along with page number and column number. This book focused mainly on the local area, Virginian, North Carolina, Maryland, and Delaware. I did not include marriages of Kings & Queens or Governors or Presidents or famous people etc. Approximately 224 pages plus introduction. Approximately 173 pages. Wills are completely typed out. Included are abridged/abstracted appraisement's, inventory's, audits and sales. Approximately 170 pages. Wills are completely typed out. Included are abridged/abstracted, appraisements, inventory's, audits and sales. This one is my favorite, because there was a murder during this time period, it's proceedings are in the will book. 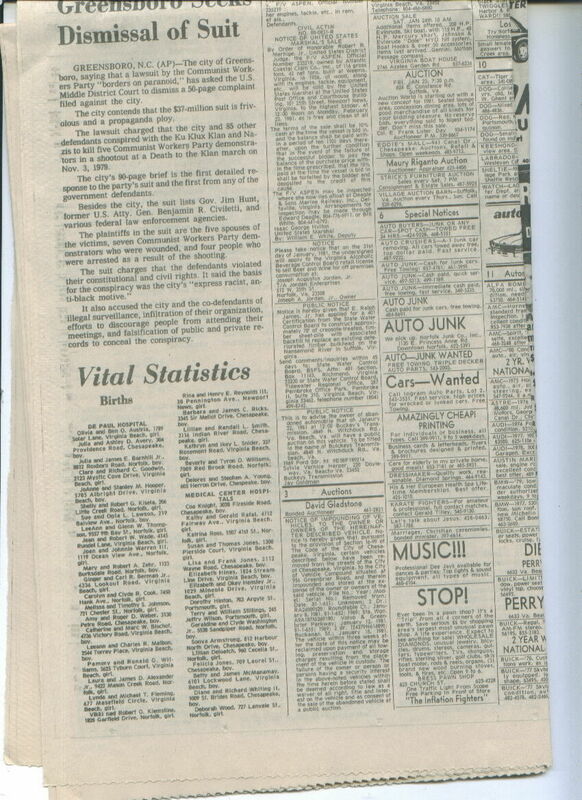 And i actually found a newspaper account of the incident and have included that too. Approximately 157 pages, Wills are completely typed out and included are abridged/abstracted, appraisements, inventory's, audits and sales. Approximately 212 pages, wills are typed out completely and included are abridged/abstracted, appraisements, inventory's, audits and sales. Wills are typed out completely and included are abridged/abstracted appraisements, inventory's, audits and sales. This book is the transition book. 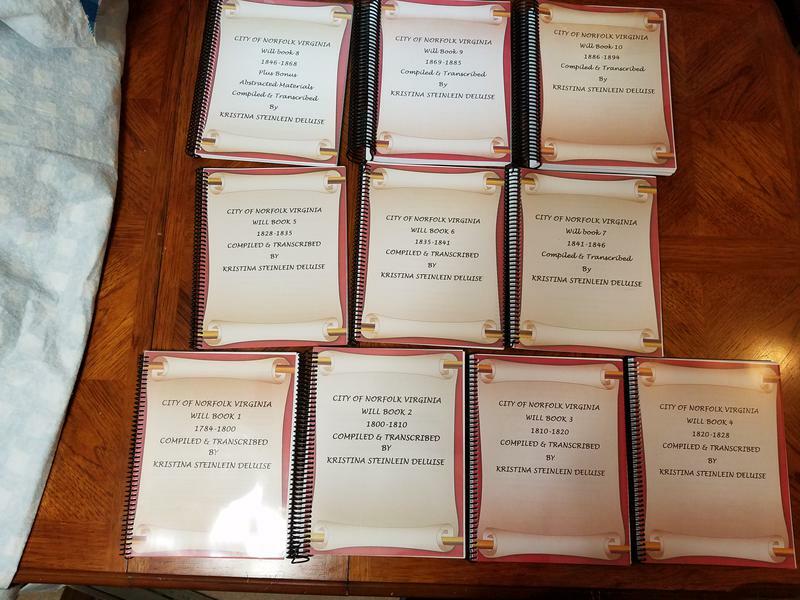 Half way through the book, audits, appraisements, inventorys, and sales disappear. And it becomes a will book only. So this period of time being available in other books, etc. I was able to locate some of the inventory's, appraisements etc and made reference to them in this book. 21. 100 YEARS INDEX 1784-1894 "With Dates"
the 10 City of Norfolk Will Books it can be found in. 22. The Ultimate 100 Years Index 1784-1894 City of Norfolk Wills More Names "Without Dates"
You will find them here, what page and which year book.